In a small bowl, whisk the bourbon (or whiskey if using), cider, sugar, 2 teas vinegar, mustard, vanilla, and cayenne. Measure out 1/4 and transfer to a large resealable bag. Add the pork chops and turn to cover. Let marinate for 1 to 2 hours. Reserve the remaining bourbon mixture for later. 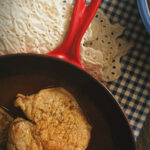 When ready to cook, pat the pork chops dry, season with salt and pepper and discard the marinade in the bag. Preheat a large skillet with the vegetable oil over medium-high heat. Place the chops in the skillet 2 at a time and cook until well browned, about 6 to 8 minutes on each side. Move to a plate and cover to keep warm. In the now empty skillet, add the reserved whiskey mixture. Scrape up any browned bits and bring to a boil. Cook until thickened, 3 to 5 minutes. Reduce the heat to low and add any juices from the chops to the pan, along with the remaining 2 teas vinegar, and butter. Allow to simmer until thickened, 2 to 3 minutes. Remove from heat. Return the chops to the pan, and flip to coat. Allow the chops to rest for 5 minutes in sauce before serving.